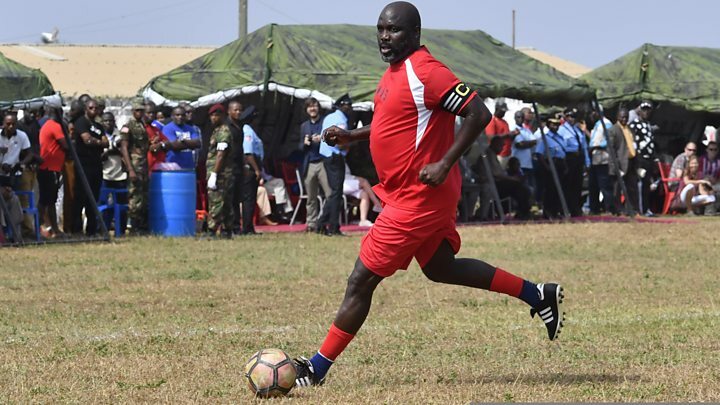 Liberia's President George Weah was once an international footballer and still sometimes plays on Saturdays as the BBC's Mike Thomson discovered when he was invited to watch a kick around where some players seemed hesitant to tackle the country's leader. The call that came in the early hours was unexpected. "The president's car is outside," I was told, "it's waiting to take you to his excellency's football match." I don't often get invites to watch heads of state kick balls about but that itself wasn't the surprise on this occasion. It's just that former Fifa World Footballer of the Year, George Weah, now president of Liberia, was supposed to be in Madagascar. Obviously plans had changed. After a hurried bite of toast we sped off through a still waking Monrovia before arriving at the Ministry of Defence. Had the driver got lost, I wondered? But sure enough, as we drove through the security gates, there behind an austere grey building, was a large football pitch. One of the first players I saw was a tall, middle-aged man wearing black shorts and a blue number 14 shirt. After ambling back and forth, without seeming to break a sweat, he beckoned to a member of his team. Seconds later a commentator screamed over the PA system: "His excellency is on the ball… he's going for goal… oh, what a pass!" 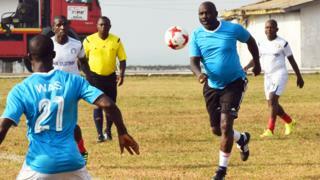 So, yes, this was indeed the former AC Milan, Chelsea and Monaco star, turned leader of Liberia. Media captionGeorge Weah is "investigating missing $100m"
But why, I wondered, while watching his side, The Weah All Stars, take on another local team made up of former professional players, was nobody trying to tackle the, now less than lean, George Weah? At half time I wandered over to the presidential dugout and asked the man himself if this was the result of some kind of presidential decree. "No, no, no," he replied swiftly. "They're afraid to mark me because I'm the best dribbler and if they try, they will dislocate some of their body. I'm very fancy." That may be but a few minutes later, his team's coach, former Arsenal player, Christopher Wreh, came up with a rather different explanation. "No-one tackles him. We do advise the team that you don't go into a tackle with the president. You avoid contact - no contact with the president." This may help explain why even at the age of 52, George Weah remains the team's top goal scorer. His team won 3-1 that day. My next encounter with the president, to discuss his first year in office, was set for 11:30 local time four days later. Though 11:30 soon became 12:30, then 13:30 slid into 14:30 and still no sign of the president. Finally, dressed in a white tunic and trousers, Mr Weah breezed into the room saying: "Gentlemen, it's time for lunch." By this point my normally fearless cameraman, Phil Darley, was looking nervous. Though not about the interview. The trouble was that his flight home to London was scheduled to leave in less than three hours' time. But he kept this to himself as we climbed aboard amid a 10-vehicle convoy and sped off, blue lights flashing, to the president's chosen restaurant. We roared through the capital, sending local drivers scuttling to the roadside, as our motorcade swept past. Within minutes of arriving at a rather modest-looking place near the centre of town, a crowd of adoring fans had gathered outside, chanting the president's praises. Was this some kind of Monrovian rent-a-crowd or firm evidence, one year on, of the president's enduring popularity? It was hard to be sure. Around an hour and a half later, lunch over, our lengthy motorcade thundered back across town. And, after a brief discussion about the delights of Liberian cuisine, my interview with the president finally got under way. How, I asked him, did he view his first year in office, why had many of his ministers still not declared their assets and what had happened to more than $100m (£75m) - worth of government money that has apparently gone missing? The president seemed to take these indigestion-inducing questions in his stride. When all was over, he asked when we were flying home. Cameraman Phil, by now in a state approaching panic, replied: "In less than an hour." "The man needs a car, right away," barked the president. And, while one of his officials called the airline, Phil was swiftly bundled into yet another security car and rushed, lights flashing once more, to the airport. It's often said that all's well that ends well. But you won't hear that from Phil. Despite his high-speed, sirened, screeching dash for the plane, he missed his flight after all. 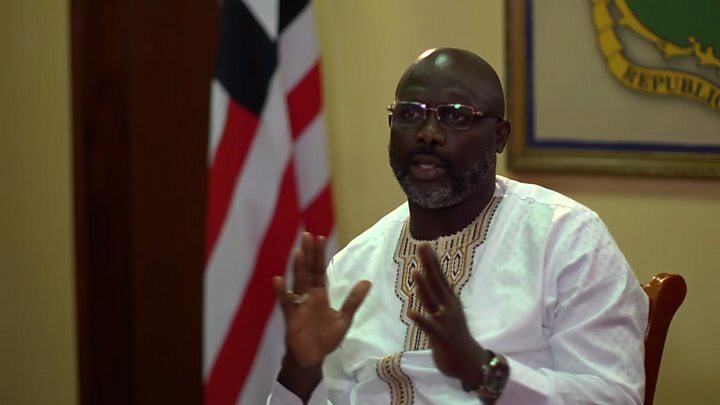 So, even for the legendary George Weah there are evidently limits to a president's powers.